In spring 2016, the Administration released a joint white paper from Research Management Services and Contracts & Grants Accounting, which recommended that UCSF should modify its current policy that limits maximum faculty effort on federally funded projects to 95%, to permit faculty to receive 100% of their support from Federal funds. The current 95% limit was introduced campuswide in 2011 after a 2010 UCSF internal audit indicated that most faculty do not devote 100% effort to Federal projects, and requiring some nonfederal support was appropriate to not run afoul of Federal regulations. In 2013, changes to federal regulations issued via the Uniform Guidance Rule that permitted faculty to spend 100% time on Federally-sponsored projects. The new rules took into account that in academic institutions, teaching, research, service and administration are often intermingled and thus difficult to delineate precisely. The new rules do not specifically provide guidance on the tolerable amount of effort for work that is unrelated to the funded project, such as teaching and service, that can be entwined in the Federal support. Several universities throughout the country have established policies permitting 100% faculty effort on Federal-sponsored projects, including Yale, University of Chicago-Urbana, University of Washington, and Oregon Health & Science University. However, those institutions have a different faculty salary structure than UCSF; their salary structures include academic year and summer salaries, common in undergraduate campuses. These institutions also have clear guidelines that require faculty to justify 100%effort on Federal research, and some only permit it for a set period. Most also include relief from teaching and other departmental or School activities as a requisite for 100% Federal-sponsored work. 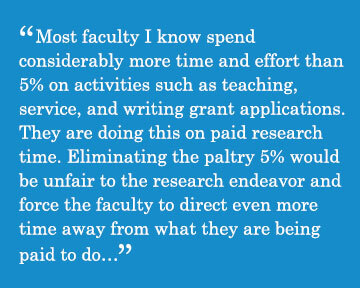 In order to gauge faculty opinions on this topic, the Academic Senate recently queried faculty members on their thoughts on the issue of either eliminating or maintaining the requirement for at least 5% non-federal salary support for these activities, as part of its Question of the Month series. Fifty-eight faculty members responded, with a slight majority favoring keeping the 5% in place. Of those who advocated elimination of the 5% rule, they also recommended continuation of the expections of faculty to participate in teaching, University and departmental service, as required by the Academic Personnel Manual (APM) for tenure and promotion. Regardless of their opinion about elimination of the 5% rule, nearly all respondents indicated that UCSF should cover the 5% non-Federal support, rather than requiring faculty to find such funding themselves. 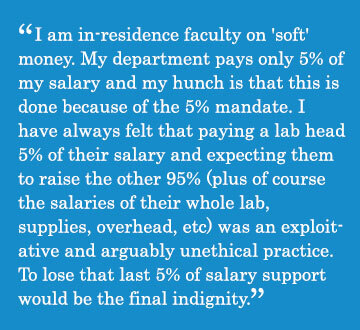 If UCSF declined to pay the required 5% nonfederal support, many thought the requirement should be eliminated entirely; the current situation in which some faculty must struggle on their own to obtain 5% nonfederal support is untenable. Most faculty respondents stressed the inherent ethical dilemma produced by permitting 100% Federal support, since University work demands substantial effort to be applied to nonfederal activities while faculty must certify that the sources of their support accurately reflect the distribution of their effort.. Some faculty reported it to be problematic if, in moving to a 100% sponsor-funded status, they were also required to cite in ERS that all their time was spent on research—when they knew this was not the case, given the requirements of service for tenure and promotion at UCSF. Faculty who are successful in raising 95% of their support from Federal sources indicated that this situation resulted in a sense that their linkage to UCSF was somewhat tenuous. 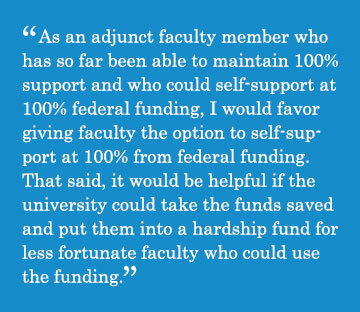 The institutional investment in many faculty who are successful in obtaining 95% of their support is already minimal. To lose the remaining 5%, and no longer receive any institutional support, was commonly described as an “indignity.” As some noted, the current 5% is low as is, and should be raised to between 10% and 15%. Those faculty who argued for the elimination of the 5% also supported that it be implemented on an individual basis. Furthermore, these faculty members noted that the current funds supplied by the University to someone federally funded at 95% do not offer the same compensation as that earned by a faculty member in the same series and rank who received 100% federal funding. Is there a way to mediate between these two positions? Neither satisfies every faculty member. While faculty members fully supported by federally-funded grants may have greater latitude to find funding that fits their research agenda, such faculty may also face additional challenges in completing the sufficient amount of service and teaching to satisfy their respective advancement and/or promotion review(s). It also presents an additional barrier for recruitment of new faculty or retention of current faculty in an already limited professional research climate. For current UCSF faculty, the possibility of a maintained or eliminated 5% is of crucial importance, because the shift to 100% sponsor funding would allow only non-grant funds to cover non-grant activities. Therefore, if the 5% is eliminated, then the burden of providing service will fall completely on faculty, depending on their individual and departmental circumstances. Perhaps the root issue is the current relationship between research faculty and the University. Many departments simply do not provide sufficient financial support for that remaining 5%. 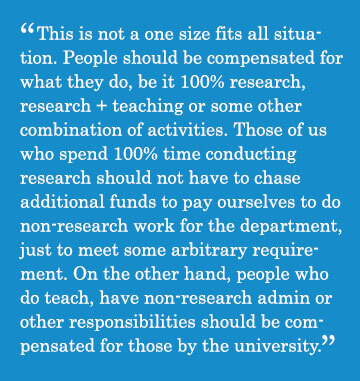 Indeed, many responses showed that research faculty already feel exploited by their respective departments and/or Schools. The removal of the remaining 5% of support could seriously further undercut morale. Although some faculty voiced support for the elimination, others noted that they would suffer greatly if they lost that final 5% from the University, and that instead the university should increase financial support. Some faculty responses indicated that if UCSF moves to allowing faculty to be 100% sponsor-funded for research, this should be an individual choice and not a campus wide mandate. Institutional and academic personnel guidelines addressing issues around advancement and promotion should be in place prior to such a change being implemented. The Senate therefore encourages the Administration to address ethical and audit issues raised by faculty in their responses. A Senate Task Force, which will report to EVCP Lowenstein in January 2017, is currently examining this question in more detail. Specifically, Task Force members are looking at its impact to faculty and the University across various areas including advancement and promotion, audits, faculty equity, and recruitment and retention.